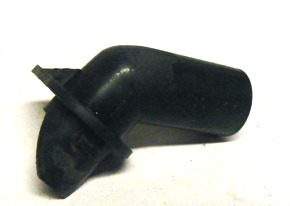 This is a Used GM heater fan hose mounting brace for 1970 - 1992 Camaro and Trans Am. This unit mounts onto the air conditioning engine bay suit case. Air blows through this into a rubber hose which connects onto the heat and AC cabin blower motor. This keeps the fan running cool as it operates. This specific piece bolts to the suit case to correct the rubber hose to it. This is a Used GM heater fan hose mounting brace for 70-92 Camaro and Trans Am. Unit connects the fan motor bypass hose from the fan.